What are X-rays? Simply, X-rays are black & white, two-dimensional images of the interior of a body. These images are generated by passing radiation (i.e., photons) through the body area. The level of photonic absorption varies among body tissues, resulting in imagery that differentiates fat, bone, muscle, tumors, or other masses that is captured on film. X-rays (radiographs) are the most common, most readily available, and the most affordable imaging diagnostic testing method in any veterinary clinic. More importantly, X-rays provide valuable information when used in conjunction with a thorough physical examination to diagnose potential health problems with your pet. X-rays enable our doctors to evaluate the size & shape of organs, see fractures, identify foreign objects, detect fluid accumulations, and view many other abnormalities. 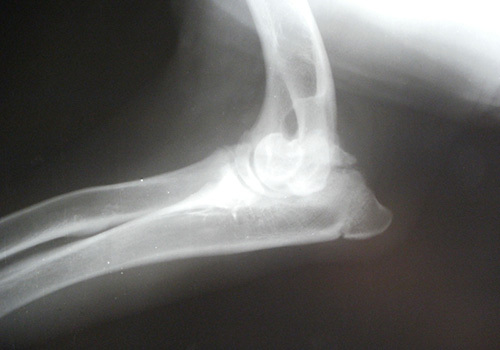 As such, we routinely use X-rays prior to other imaging techniques. We commonly use a Dental X-ray Machine to locate cavities in early stages of development. When possible, we repair the cavities. In other cases, the affected tooth can be removed. Dental x-rays can truly prevent your pet from experiencing pain while potentially saving you money in the future. A subcategory of x-ray studies use contrast dyes to highlight certain structures. The most familiar of these is the barium series, which can help diagnose some blockages or obstructions that may not be visible on a standard x-ray. In the barium series, a liquid or paste containing barium is given orally or by enema. A series of x-rays are taken along timed intervals as the barium progresses through the stomach, into the intestine, and then to the large intestine. Since the barium shows up as bright white in the x-rays, a blockage or obstruction will be readily visible should the outline of barium abruptly stop or create irregular shapes.